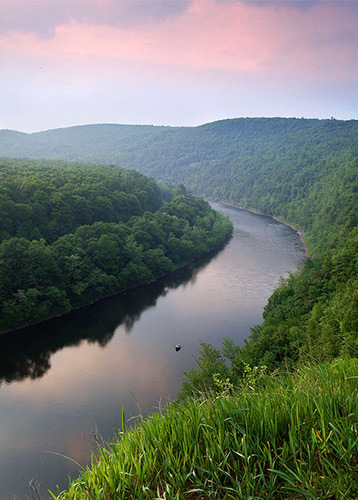 January 24, 2008 - Delaware Riverkeeper Network received a hotline report January 23rd about a new gas pipeline being laid in Hunterdon County, on the south side of Route 12, Kingwood Township and Borough of Frenchtown, NJ. The company began laying pipe into the right of way along the south side of Route 12 but it was reported that the pipeline seemed to be encroaching on several streams that crossed the highway. DRN staff investigated and discovered that the company had not secured any permits or approvals from NJDEP, despite the fact that the pipeline would need to cross several streams, all of which are Category 1 streams, requiring a 300 foot buffer (Lockatong Creek and 2 to 3 tributaries to Lockatong Creek, Little Nishisakawick and Nishisakawick Creeks). DRN reported the violation through the NJDEP hotline on January 23, case number 080123134253. DRN visited the site on January 24 and photographed land disturbance, vegetation removal, evidence of an attempt to auger under at least one of the streams (Lockatong Creek), substantial vegetation disturbance and excavation within 25 feet of the stream and lack of any erosion or sediment control measures. Land excavation was also evident within approximately 15 feet of another stream crossing. Silt and sediment runoff from one excavation to the creek was documented. A further report was filed with NJDEP enforcement division from the project site by DRN. NJDEP issued a stop work order on January 24. Elizabethtown Gas Co. will need to secure the proper stream crossing permits in order to resume construction of the pipeline. Since there is a 300 foot buffer on each side of each of the creeks that need to be crossed, it is likely that the company will be issued a Notice of Violation by NJDEP for soil and vegetation disturbance within the buffer area. The company had disturbed land and prepared it for excavation for at least 2 miles from the intersection of Rt. 519 and Rt. 12 at Baptistown and had illegally encroached on at least 2 streams. No disturbance to the west of Rt. 519, where the Nishisakawick and Little Nishisakawick creeks are located, had yet occurred. DRN also reported the lack of sediment controls to Hunterdon Conservation District, who is further investigating the implementation of the approved erosion and sediment control plan for the project. The gas pipeline is planned to deliver natural gas to the Kingwood Business Park, which is under construction on Route 12, and to Frenchtown Borough. 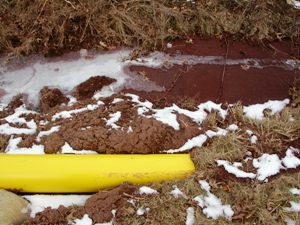 According to a public presentation about the project, the pipeline originates at Magnesium Electron in Kingwood Township, is an 8-inch polyethylene pipe, and will be 50-60 psi.